A claim of bed bugs at a popular Colorado resort is being directly disputed by the resort itself. COLORADO SPRINGS, Colo. -- A claim of bed bugs at a popular Colorado resort is being directly disputed by the resort itself. Sarah Avrech of Severance, Colorado posted a video on Facebook of a bug crawling around on a tissue. The post has more than 60,000 views. Avrech says she plucked the bug off the pillow her daughter was sleeping on at the Great Wolf Lodge in Colorado Springs during their stay at the resort this past Sunday. "I called down to the front desk right away and told them that we had found a bed bug," Avrech said. She says they then packed up, went down to the desk and talked to a manager. "And I said, 'I found a bed bug in my room,' and he said, 'Well - we think it's a beetle,'" Avrech told Denver7. 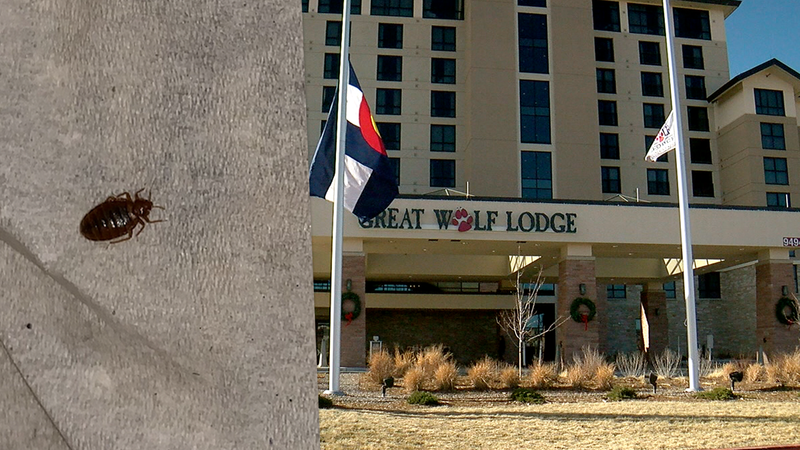 Great Wolf even provided Denver7 with a pest control service report showing inspectors checked the room later that day, Monday, Jan. 28. Integrated Pest Management found no bed bugs in Room 806. Its official report says, ‘No Activity Noted.’ The report is time-stamped 4:14 p.m. on Jan. 28, 2018, which is just a few hours after Avrech checked out. Avrech says photos of the bite marks on her daughter prove otherwise. "I just feel like they were dismissive and they didn't react like I would hope a hotel would," Avrech said. Avrech says implying they brought in bed bugs in mid-winter is simply absurd. As for whether she’ll return, Avrech said she doesn’t know.